We have written and recorded about 50 original songs and many of them have been somewhat autobiographical in nature. Our most concerted effort in this direction came with the recording of our PRAIRIE SAGA concept album. It opened with a tribute to the various North American Indian tribes and went on to a song inspired by my grandparents who settled on our homeplace in 1878. The album continued with the fond memories I have of growing up in a prairie farm community and my love for this part of the world. The saga of this +50-year-long journey really comes alive though, with the arrival of my partner in life and love and the memories of our performing years and music tours together. All of this is segued with our devotion to family and our various "day job" careers. I've included an introduction to each set of lyrics as well as links to the actual recordings. We dedicate this "Saga" to our three kids -- Ja-On, Robin and China-Li -- who were with us for much of this long journey -- but I'm sure many of the experiences that unravel here will perhaps provide them with a deeper insight into what makes "the old folks" tick. Both Sue-On and I are educators. Two of our favourite subjects have been geography and English. One reason for the creation of Massacre was to show students how native Indian place names have enriched our North American landscape. In addition to serving as a tribute to those who came here generations before my ancestors, I felt that the writing and recording of a song using colourful Indian names was an excellent way to enhance my teaching. As you can hear in the lyrics, I tried to string together the fascinating names of Indian tribes in a lyrical and rhythmic way. We enjoy doing this song on stage -- and I guess the performances which stand out most in our memory were the times we sang it in the back-to-nature setting of the Boggy Creek Call of the Wild Country and Bluegrass Festival. We were quite involved in the event for many years, both as performers and organizers. Our appreciation of Canadian aboriginal heritage was further enhanced during my four-month teaching assignment in Northern Manitoba on the Pukatawagan First Nations Reserve. I was teaching university courses on a Brandon University satellite campus. The University regularly flew me to Puk and back. Following this I was assigned an permanent office on the BU campus, but my northern adventure was an unforgettable experience. A few years ago, one of my job assignments as a professor at Brandon University was to spend four months teaching computers and journalism in the BU classroom at Pukatawagan -- a remote First Nations community in northern Manitoba. There is not much entertainment in Puk in the middle of winter, but I had my guitar with me. There is something about the isolation of Puk that lends itself to singin' the blues. Pukatawalkin' Blues is the result of that experience. My next-door neighbour, Sidney Castel, was a sort of local celebrity. NCI Network Radio played his single, The Pukatawagan Song, in constant rotation. I was spending much of my time researching Puk history and scanning vintage photographs of Indian life in the North. Most of the photos were brought in by students from their personal collections. To add a bit of colour to this project I invited Sidney to my class to relate his life experiences in the North and to answer questions about his stage and recording experiences as a native performer. The session ended in a "guitar pull" singing session where I performed my Puk Blues in answer to Sydney's Puk Song. He related his string of misfortunes concerning guitars. His wife, in a jealous tiff, had kabonged him over the head with his first instrument when she thought he was paying too much attention to some of the ladies during one of his bar performances. His second guitar had been stolen. Sadly, Sidney died a year later, but I'm sure that the memories of this event touched everyone involved. I joined the local band for a few social events and when my 30 adult students learned I was doing a show with longtime Canadian pop idol Bobby Curtola after I returned to the Southland they started to raise funds to pay for their trip down for the show. My great grandfather came west in 1878 with his family and possessions to homestead a tract of land south of the Little Saskatchewan River Bend settlement -- near the present location of Strathclair. I was raised on this farm and we still maintain a home on this homestead site. This song was written as a tribute to those early pioneers. Besides trying to express our love for this area where my ancestors sank roots so long ago, I was also trying to show how much I feel we owe to our heritage. William G. Hillman, B.Sc. (Hons), B.Ed., M.Ed. The glory years of Strathclair and many other similar prairie communities reached their zenith in mid-twentieth century -- the '50s decade. The excitement and spirit generated by these towns was perhaps best epitomized by the Saturday Night "event." Following the Saturday evening supper hour, families would prepare to "go to town." The first cars to arrive would get the best seats. This meant finding a diagonal parking spot along the north side of main street (North Railway Street) in the well-lit, high-traffic area extending from the pool room at Minnedosa Street to the modern 'self-serve' department store at Campbell Street. Between these termini, people of all ages walked a jostling gauntlet along a strip of thriving businesses. Three favourite spots were the drugstore with its soda fountain and magazine rack, the Chinese cafe‚ with its booths for socializing, and a rival eatery which featured a jukebox, pinball machine and lunch counter with stools. Many of the men gathered in one of the two male bastions -- the beer parlour and the pool room; while a favourite routine for the women was to peruse the line of parked Fords, Chevies and Dodges -- each vehicle demanding a nod, wave or a detour off the sidewalk for a chat. When the week's discussion lagged out on the street, there seemed to be no end of open doors to shops to provide diversion: bakery, grocery, dry goods store, newspaper office, garages, butcher shop, hardware store, restroom, shoemaker, and tinsmith. In the winter there was always skating, curling and hockey at the rink. The routine for some, and certainly for myself, was to go to the 7 o'clock movie at the Bend Theatre, delaying the sidewalk promenade for later. From a thirty-five cent allowance, kids could eke out a full night's entertainment which included a movie (complete with newsreel, Three Stooges short, cartoon, serial, previews, and draws for prizes), popcorn, "coke" or popsicle, double bubble gum, jawbreakers, and a fifty-two page or 3-D comic book. Later in the decade, many people gathered outside the electric shop which provided an outdoor speaker connected to the twenty-one inch television in the window, few realizing that this box with its flickering black and white pictures was a harbinger of drastic change to this weekly social phenonemon that everyone took for granted. The lyrics pretty well tell the whole story of this song. We were trying to create, on record, a bitter-sweet feel akin to the moods of Autumn on the prairies -- and our country home: the cool fall breezes, birds migrating to the south, stubble fires, falling leaves, harvest moon, dew turning to frost, shortening days. All of this contrasting with the strangers, loneliness of crowds, and pollution associated with urban living. If we succeeded in this I believe we owe it to Sue-On's wistful interpretation. This song was written as sort of metaphor. It was inspired by memories of the rather difficult time that Sue-On and I had during our three year courtship. One of the obstacles we faced was Sue-On's being sent to live and work with relatives for a year in distant Winnipeg. This attempt to separate us was not successful, but it was often a sad and stressful time for both of us. We were able to marry when Sue-On turned 18 . . . the start of a long and beautiful journey. A true love story. We have had a long relationship with oriental culture. We have a deep respect for oriental art, music, traditions and martial arts. Our living, recreation, and work areas are all adorned with Chinese art and furnishings, of which the Chinese moon door on the cover of CD Vol. 10 is a good example. This appreciation of 'the East' has carried over into other areas as well. As a family sport and discipline we studied Wado Kai Karate -- a martial arts style developed by Supreme Instructor Masaru Shintani, 8th Dan. Under the instruction of Sensei Bruce Dunning, we have both achieved the rank of 1st Degree Black Belt. We assembled our regular Canadian cast of characters to record this one at Century 21 Studios -- a very up-to-date facility housed in a converted synagogue in Winnipeg's North End. This entourage was made up of musician friends we have worked with for many years: Alan Jones is a physiotherapist, musician and songwriter blinded as a child in wartime England. We encouraged him to try to get some kind of an oriental sound out of the massive Yamaha studio organ. Kevin Pahl is daredevil cropduster and musician extraordinaire who did a fine job at eking a vibes/celeste-like sound out of the Fender Rhodes piano. Barry Forman a champion fiddler, car dealer and former teacher thumped away on bass -- a task he performed so many times on our sessions. Sue-On and I were singing while playing drums and guitar. Meanwhile, engineer John Smith -- who had worked with the Beatles at Abbey Road and had received a credit on their double White Album -- tried to pull it all together in the control room. Also sitting in at the console for this session was another musician friend -- Kerry Morris -- pilot, hang glider, computer systems analyst - who joined us a few years later as our regular bassist and drummer. I wrote China Song with considerable help from Sue-On -- if you listen closely it should be easy to pick out her contributions -- I am not exactly fluent in Chinese. From our first meeting I have been constantly amazed at what this person -- my soul mate -- is capable of achieving. Sue-On was born in southern China, but her family lost everything there during the Communist Revolution. At age two she was smuggled out of China with a neighbour family and lived with her grandmother in Hong Kong until her mother and siblings were able to follow. Eventually, at age 10, she and her mother were allowed to join her father in Newdale, a small prairie town in Canada, where he and his father had owned restaurants for many years. She mastered English and adapted to the new culture while working in her family's restaurant. After we married she joined me in performing on stage -- singing, and playing drums and keyboards. She then completed University (BA, B.Ed) and worked as a high school teacher, as well spending time as a Field Supervisor for the University of Manitoba and Brandon University -- all this while maintaining a frenetic performing schedule and raising three kids. When we took over the long-established Choy family restaurant -- SOO's in Brandon -- she added the role of restaurant manager and entrepreneur to her slate of accomplishments. We sold the restaurant after ten years and Sue-On resumed her role as an educator. This time she worked as an English for Academic Purposes instructor at Brandon University -- teaching international students from all over the world. Not the least of her achievements has been her ability to put up with my idiosyncrasies through all these years. It is ironic, considering all the trouble Sue-On's family had in getting out of China that, for a while, Beijing became one of our largest radio audiences. Sue-On's brother-in-law, Wai Kai was captured by the authorities after having paid to be smuggled out of the country by boat. It was 17 years before he was able to join his wife and daughter in Canada. After coming to Brandon, he stayed in touch with a friend who had been assigned the job of music programmer for Radio Beijing. When China relaxed its ban on 'things Western,' there was a great thirst for music from America and some of the first imported tapes they heard were ours -- Choy revenge? This song is sort of a typical lonely bar song, but it is somewhat autobiographical. Sue-On and I had a long courtship and we faced many obstacles that kept us apart for over two years. A girl -- and a prairie town. For many years we were based in our Maple Grove country home on Highway 354 near Strathclair. I taught high school through the week and we spent the weekends on the road driving to gigs all over Manitoba and into Ontario and Saskatchewan. We had quite an obsession with all things musical: weekend gigs, songwriting, recording, radio/TV, and summer tours which took us all across the prairies and even farther afield to the USA and UK. 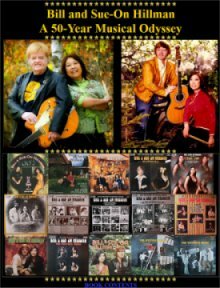 We have spent many summers touring Western USA and Canada -- performing with American acts on grandstands at rodeos and State, Provincial and County Fairs. Many acts were from Nashville, but the ones we found most interesting were the variety acts from California. Our US booking agents were the Bardines who were veterans of the last days of Vaudeville, so it was not surprising to find a multitude of fascinating, experienced acts on the bill. We rubbed shoulders with, and took show biz lessons from, magicians, ventriloquists, comedy pickpockets, trick cyclists, dancers, standup comics, tenor banjo players, chorus girls, singers, acrobats . . . the gamut. When we were not listening to inside stories about Greats such as Bob Hope, Ed Sullivan, and the Marx Brothers, we basked in the aura of enthusiasm that surrounded these seasoned entertainers. All of this played out against an almost incongruous backdrop of the 'wild west.' Inexplicably this, coupled with my love for geography and heritage, seemed to pull me back into the traditions of the western setting we were touring - hence this song. We tried to convey some of the Montana Big Sky feel through some unusual studio effects which included flanging the strings and fading the ending with a lonely wind effect. For many of our years on the road our bass player, Barry, doubled on fiddle. So I wrote a number of songs to feature his electric fiddle which he played through numerous effects such as a wah-wah pedal. This, and our fondness for artists such as CCR and Doug Kershaw, led us to an appreciation of swamp and Cajun music. As a result, some of the songs I wrote were with these themes in mind so as to feature his fiddle. By the time we recorded this song in England, however, Barry had left the band, so it was adapted with quite a different feel. It does give a nod though, to the great diversity of audiences we have entertained, the many distant places we travelled to, and our ongoing search for distant horizons. This is a novelty song about our stage exploits and the experience of performing many decades worth of one-nighters. It was recorded during our Newcastle sessions in England. This studio, like so many of the places we played in England, was inaccessible in the extreme. We had to pull our gear up many flights of stairs and through a seemingly endless number of doors because the facility was situated on the upper level of a large bingo hall complex. After surviving this ordeal which anyone in his right mind would have left to roadies, I returned to re-park our Ford Transit van only to find that the meter maid had decorated it with a parking ticket -- to add infuriation to fatigue. The band's on the run again. This autobiographical effort was written during a rather laid-back and reflective mood. Although we tour far afield most summers, the remainder of each year is spent playing one-nighters. The experiences we have shared while performing in a different town every night has developed bonds with which only musicians can identify. The fact that we are married has seemed to intensify marital bonds as well. Our closest lifelong friends have always been musicians and some of our most cherished moments could only have come about through our performing experiences. Dovetailing other careers with our music has been the source of some frustration over the years -- family and teaching careers have always come first. This has meant that we have not always been able to follow up music opportunities, but the moment we step on stage, any stage, the rush of performing kicks in -- a cure-all for all maladies. One Night Stand was recorded at Impulse Studios at Walls End in Newcastle-On-Tyne, England. The studio is located close to the eastern limit of Hadrian's Wall -- a wall built by the Romans to keep out the wild Scottish tribes. The wall was not too successful in holding back Scots from the studio ... we invaded successfully, as did quite a number of Celtic groups, such as the Chieftains, who used the studio regularly. These Newcastle Sessions came about at the end of our second tour of Britain and resulted in 14 songs for Album #7. One Night Stand was culled as a single and was our first charted song to break the Top 10. We eventually performed it on the CBC network-televised Canada Country Music Week concert at the Winnipeg Centennial Auditorium - backed up with a 20-piece orchestra. Our fondest memories of this event, however, centred around our backstage bull sessions with fellow entertainers George Hamilton IV and The Family Brown, swapping stories about performing in England. I wrote this around the time that the Nashville "outlaw" music was in vogue and we had started our annual music tours of England. As we got further into our tours the image seemed to fit. We did a variety of Country Rock which wasn't being done my many English performers at the time, but threw in a few Shadows and Lonnie Donegan numbers. We were a long-haired, "American" sounding, gang of three decked out in rugged, chamois leather patch outfits. We had actually bought these outfits in a little specialty shop just off London's busy Oxford Street. We worked most gigs there as a trio, but our friend Alan Jones joined us in clubs that had a Hammond on stage. Most of our amps were Traynor, since we were sponsored by this Canadian company. After landing at Heathrow we picked up our equipment at Wing Music in Bromley, Kent and made the trek to England's Northeast. Kevin Pahl played a stack of Hohner keyboards, Sue-On played Rogers drums and I played my Fender Telecaster with my self-designed, patented B-bender. We played a different club every night -- and were enthusiastic tourists through the day. We wound up every tour with recording sessions in London, Newcastle and Pity Me, near Durham. Sue, she's in the loo - she's trying to get her face wet. They can't understand 'American' -- "What's he sayin'?" When Housey Man, up on the stand, says, "I say Chaps - Stop!" Reelin' in Soho is an account of our first recording session in London, England. As suggested in the first verse, this was the culmination of a tour in which we -- "The Hillmans From Canada" -- had played over 30 one-nighters in night clubs and discos across Northern England. Many nights found us in the ubiquitous Workingman Clubs where a house band opened at 7:00 pm, followed by opening acts which usually offered variety entertainment. We would then come on for a show set, after which there would be a long break for housie (bingo) -- a national addiction. After this exciting gambling break we would return for a dance set -- but by 11:00 pm the dancers would call it a night since they had to work the next day. Being so used to the long drives, long gigs and late nights back in Canada, it was hard for us to wind down so suddenly and every night found us driving around looking for some place which might still be open. We met some very colourful characters on these midnight rambles. The audiences attended these clubs every night of the week and had seen it all, so it was especially rewarding to 'go down a bomb'... to 'bomb' has a different connotation there than it does in North America. It was tremendously exciting to study the dressing room walls which were festooned with pictures, cards and stickers left by previous entertainers -- even the Beatles, early in their careers, had toured this circuit. These backstage walls were seldom refurbished since it seemed that the more 'name' acts displayed, the more prestigious the club. Perhaps the most fascinating venues though, were the Country and Western Clubs where nearly everyone showed up in full Western regalia -- including boots, hats, gunbelts ... and western drawls -- Geordie cowboys. Our strangest and perhaps most memorable night occurred at Thirsk -- a village in Yorkshire. Throughout the tour, we spent most mornings and afternoons being tourists - traipsing through castles, cathedrals, and pubs and across highlands and moors. Thirsk, however, offered a special reward because it is home to Alf Wight, aka James Herriot of All Creatures Great and Small fame. We visited his veterinary office and toured his small museum just down the street. Fittingly, the club we were to play was on the outskirts of town surrounded by a meadow or cow pasture. It was a 1920s pavilion-style hall. Our opening act for the night arrived late -- surrounded by an entourage of people in formal wear. He was a singer who had been married just a few hours before up in Newcastle. This set the mood for the whole evening -- the place seemed to explode and although the club should have been emptied by 11:00, the management barred the doors to keep out the local constabulary and the party continued into the wee hours. When Sue-On wearied of the drums, a succession of people -- our agent, the bartender and even the groom - took control of the sticks. Something right out of the fictional Darrowby. This is a Rock-a-Billy flavoured song. My first exposure to rock 'n' roll was through the Memphis Sun Records artists: Elvis, Carl Perkins, Johnny Cash, Jerry Lee Lewis, Roy Orbison, Ike Turner, et al. The excitement generated by these early rockers has been a major musical influence. The idea for the song came during a long wait at London's Heathrow Airport during a work-to-rule strike. Sue-On was pregnant with our first child, Ja-On, and we perhaps were a little nostalgic and homesick after having toured for seven weeks in a foreign land. It had been a very successful tour culminating with the recording of five sides in a London studio, but we have always been 'homebodies,' -- a defence, I guess, from the craziness of the road. It was approaching harvest time on the prairies and we were looking forward to experiencing our unique fall rituals and even seeing the stubble fires which light up the night skies on every horizon. We had loved the experience of this, our first tour of England -- the Newcastle Brown Ale, the ocean, the history, the Geordies, clubs, football, housie, BBC, Blackpool ... everything -- but it was time for homefires. The song was recorded three years later at Guardian Studios in northern England, during our third tour of the UK. This 24-track studio was set up in two adjacent row houses on High Street, in the tiny village of Pity Me, just outside the beautiful, historic City of Durham. The studio was a labour of love and brain child of owner/engineer Terry Gavaghan who saw it as a means of getting 'off the road' while still staying in the music industry. He invested the money he had saved touring as lead guitarist for the Carpenters -- here in this quaint little Yorkshire village. This choice of locale was perhaps not as unusual as it might first appear as England's Northeast is saturated with clubs and musicians. In fact, Alan Clark of Mark Knopfler's Dire Straits band played all the keyboards on the 20 songs that came out of those sessions. We later performed Sail On at the televised Manitoba Association of Country Artists (MACA) Awards during Country Music Week ceremonies where we were backed by a large stage band complete with fully-charted arrangements -- quite a contrast to the small combo approach we took on the record. When the two other members retired from our Western Union band we used the name The Hillman Express for awhile. Eventually we became Bill and Sue-On Hillman. I wrote The Hillman Express as a signature piece for opening and closing some of our shows. Obviously it was meant to play on a train theme . . . just a rockin' dance number to get the audience jumping. I was sometimes compelled to integrate my love of music into my role as an educator. a graduating class of students and my teaching colleagues. accompanied with guitar and rhythm riffs. SHIPS LANTERNS - CHESTS - SOUND FX - STOOL - GUITAR - ETC. -- and to learn the skills to survive on this life sea. which constantly remind them of what they could have been. when the going gets long... or rough. to cope with each unpredictable crisis along his course. but really they are just a part of life's cycle.